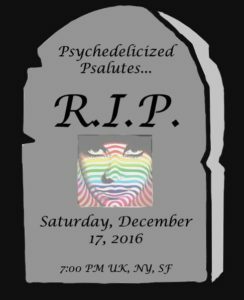 This Saturday, join Cosmic Colin for his latest show This Saturday, join Cosmic Colin for his latest show Psychedelicized Psalutes. 2016 has been quite the year and we have lost some of music’s most influential people. In this week’s Power Hour, we pay tribute to many of the artists we have sadly lost this year. Tune in at 7pm UK, NY, SF.. 2016 has been quite the year and we have lost some of music’s most influential people. In this week’s Power Hour, we pay tribute to many of the artists we have sadly lost this year. Tune in at 7pm UK, NY, SF.